As a woman’s hair tends to get frizzy, coarse, and dry at times, hair straighteners come to the rescue! 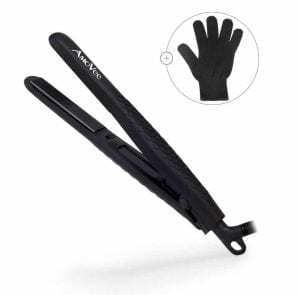 Apart from the plate material and heat controls, advanced technology is innovatively developed and constantly integrated with these hair straighteners. 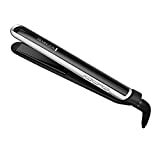 These hair straighteners are designed to style the hair while leaving it shiny, smooth, and straight. And if you want to go for those soft curls, no problem! Particular straightening irons can function as a curler as well. 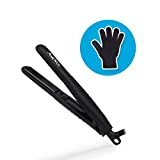 The adjustable heat setting makes these straighteners even more flexible for various types of hair whether you have thick, fine, frizzy, curly, and coarse hair. As the market offers a ton of hair straighteners that you can purchase, our list and reviews of the Top 10 Best Hair Straighteners in 2019 will help you find the hair straightener that will be suitable for your hair type and styling needs. PLATE MATERIAL: Hair straighteners are designed with different types of ironing plates. Each of these has advantages and disadvantages when it comes to heat production and straightening performance. Choosing the right type of plate material will provide you the ultimate hair styling and straightening solution according to your hair type. Ceramic: Ceramic plates have been quite popular on hair straighteners. It heats up quickly and keeps it consistently hot for a long time. It is known for its excellent heat retention which is why a lot of straightening iron brands use this plate. With the right amount of temperature, ceramic hair straighteners make the hair shiny, smooth, and straight. However, don’t confuse ceramic plates with ceramic-coated plates. Ceramic-coated plates are low-quality plates that are vulnerable to hot spots and further damages. Tourmaline: Tourmaline is a high-quality ironing plate that is known with its consistency in heat production and also makes the hair smooth and softer. As tourmaline is sourced out from precious materials such as gemstones or minerals, it comes with an expensive price tag. Despite the price, true tourmaline plates guarantee an exceptional durability that keeps the straightener from chipping and damaging. It is usually plated over ceramic plates to provide a softer, smoother, and shinier hair. If durability and high-quality are your priority regardless the price, you can go with tourmaline plates. 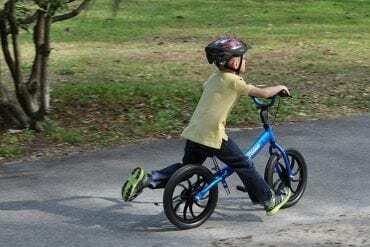 Titanium: Another option to consider is titanium. If you’re always on-the-go whenever you’re in a hurry for school, work, or errands, a hair straightener with titanium plates might be your ultimate solution. It heats up quickly so you can style or straight your hair in no time. As it does not transfer too much heat which can be pretty damaging to the hair sometimes, it can go well with the ends of your hair and leave them styled according to your preference. It is incredibly sturdy that can provide longer service for many years to come. HEAT CONTROL: A setting for the heat control is an essential feature you should take note of when buying a hair straightener. When it heats too much or heats below the average temperature you need, it won’t do any good. 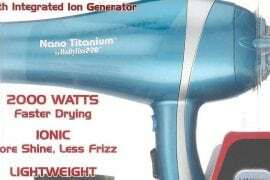 You can either wait for the iron to heat up and waste a lot of time or let it heat too much and damage your hair. Heat control settings allow you to adjust the temperature or heat production from the lowest, moderate, and up to the highest or optimal temperature. This setting is usually available on the side of the straightener which can be customized through the preset buttons or digital settings. Some units indicate the temperature that will help you adjust according to the heat level you prefer. HAIR TYPE: It is an important factor to determine the type of hair you have. Whether it is frizzy, curly, coarse, dry, fine, or thick, there is a compatible hair straightener for you. Choosing the right straightener according to your hair type will prevent the risks of hair damages. It will rather provide the ideal styling or straighten you want for your hair while keeping it smooth, soft, and shiny. Thoroughly checking the plate material and the manufacturer’s instructions will help you know if the straightening iron you’re buying suits your hair type. SAFETY FEATURE: Some units are engineered with auto shut-off feature that automatically shuts down the hair straightener when inactive for a specific period. Some straighteners shut off when they are idle for 60 minutes. This gives you a peace of mind, especially when you’re forgetful, and you tend to leave things on. It prevents damages and accidents. 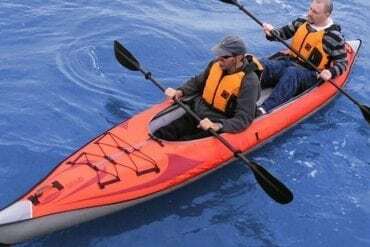 SIZE: Size also matters depending on how you would use it. If you often travel, you can go for mini hair straighteners which are travel size and lightweight. It can also be a great option for those who have shorter hair. Bigger sizes with wider plates might be a perfect choice for women with longer and thicker hair. It saves time and effort, too! It is a practical option to use a portable and compact hair straightener when you often travel to many places. You can just take it in and out of your bag effortlessly whenever you’re in a hurry! 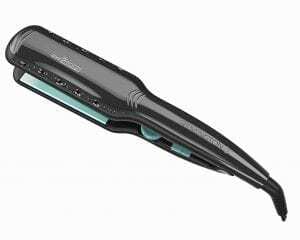 This on-the-go flat iron from AmoVee comes in a compact size but loaded with high-quality features. It is lightweight, too! 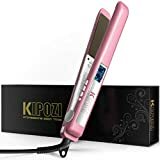 With the superb technology of ceramic and tourmaline, this mini flat iron can give your hair an ultimate transformation to help you achieve soft and straight hair, polished curls, and flawless waves. It can deliver a constant heat between 365F and 410F. As it is crafted with tourmaline and ceramic material, you can use it for all your styling needs for many years to come. It emits negative ions that help eliminate frizz in the hair while keeping it smooth and less prone to damages. 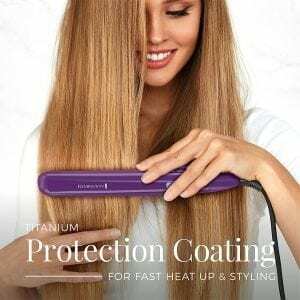 Remington is one of the reputable brands for hair straighteners that keep the girls and women impeccably beautiful with their smooth, soft, and tangle-free hair. 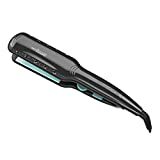 This Remington hair iron is designed with the technology of ceramic and titanium plates which can retain the heat for long. The combination of these high-quality and durable plates protect your hair from potential hair damages. It is also applicable on wet and damp hair with the use of unique steam vents. Though most hair straighteners don’t allow you to iron your hair until it’s completely dry, you won’t have to do it with this hair iron. So if you need to straighten or style your hair to save time, Remington Wet2Straight handles it all for you in no time! This hair straightener can heat up as fast as 30 seconds! It has an indicator that tells you when it’s ready for wet and dry hair. It delivers a constant heat up to 420F, but you can always adjust the temperature with its 30 heat settings. Taking this spot is another entry from Remington. 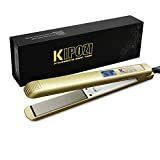 The S9500PP Pearl Pro Ceramic flat iron boasts its professional salon styling technique that will transform your hair according to the style you want. The plates are infused with real pearl that allows the iron to glide smoothly on your hair. It distributes even heat and eliminates the frizz that will give your hair the soft and smooth texture whatever the style is. It is crafted with heat settings that can go up to 450F which is the optimal heat in most salons. With its digital display, you can easily customize the heat setting. And as what most Remington hair straighteners offer, the S9500PP has the 30-second powerful heat- perfect for an on-the-go styling! But even at 15 seconds, you can have this iron ready for styling whether you go for the curls or straight ends. And if you left it unattended after 60 minutes, it shuts off automatically. 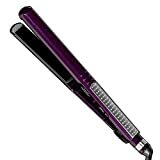 If you prefer a straightening or styling iron that heats up quickly, go for the titanium plates. 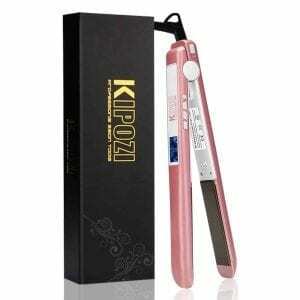 And one of the brands you can try is the Kipozi professional flat iron in rose pink! Apart from its feminine shade, it’s loaded with stunning features that will smoothen out the hair without all the frizz and dryness. It uses an advanced MCH ceramic heater and far-infrared technology that emits negative ions, leaving the hair shiny, sleek, and smooth. When it comes to the heat settings, you can choose from 270F to 450F according to your hair type whether it is fine, coarse, frizzy, or damaged. With its 3D floating plates, you can use it safely on any hair length. You won’t also have to worry if you leave it unattended for 90 minutes, this hair iron will automatically shut off to prevent accidents and further damages. It’s easy to use, heats up quickly, and works as a curling iron as well. If you wish to flaunt your hair with greater volume, shinier and smoother texture, the Infiniti Pro might offer another option you can check out. With the merged technology of ceramic and tourmaline, the production of heat is constant and reliable leaving you with an optimal heat to smoothen, straighten or curl your hair. In just 15 seconds, it’s all prepped for quick styling! And because it comes with an extra long swivel cord, it is much easier to iron the hair. The highest heat it can offer is 455F though you can still opt for the 30 heat settings. With its wide range of heat options, it can be used on different types and lengths of hair. Whether you have frizzy, coarse, fine, delicate, stubborn, short or long hair, you can adjust the temperature that is suitable for your hair type. 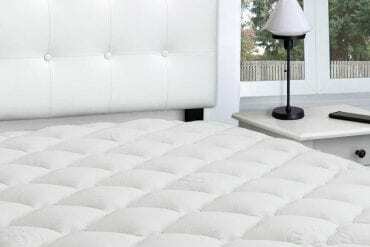 With its high-quality material, you can rely on its professional styling for many years to come. 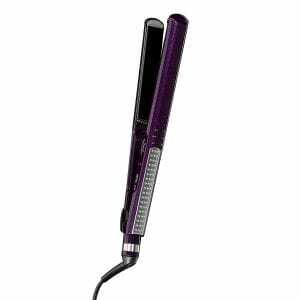 If you have long and thick hair, you may need a larger hair iron with wider plates. 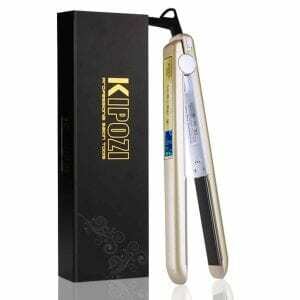 The Kipozi Titanium hair iron might be your ideal option. Besides the wider plates, it uses titanium material that produces heat in a matter of seconds. It retains heat for a long time and allows you to style and straighten your hair the way you want to! It distributes heat evenly that leaves your hair shiny, silky, and smooth. With its ergonomic handle, rounded edge design, and swivel power cord, ironing the hair is hassle-free! It glides smoothly on the hair whether you straighten or curl it according to your desired style. It emits heat up to 450F and automatically shuts off when not in use after 60 minutes. 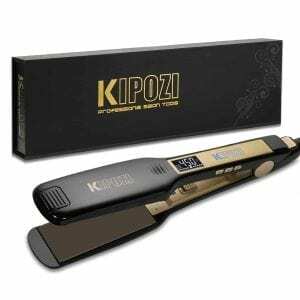 Another Kipozi hair iron that you can try is this nano-titanium flat iron. The technology that emerges from the nano-titanium material protects the hair from damages. It glides smoothly and pulls out your hair flawlessly with zero pinching. The 3D plates play a role that makes ironing much easier while leaving it smooth, silky, and shiny. Engineered with heat options, you can personalize the heat according to your hair type. You can adjust the temperature and set it to the optimal temperature whether you have fragile, damaged, or healthy hair. You can view the settings on the LCD screen. This comes with a manual that’ll help you out with the accurate instructions. 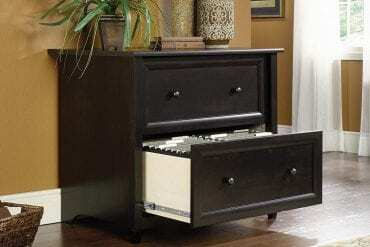 And for convenient and space-saving storage, it is crafted with a locking switch design. Babyliss is one of the popular brands for hair styling equipment. And if you rely on reputable brands to pump up your hair, try this Babyliss Pro nano-titanium straightening iron. It is recommended for those who have short to medium length hair. It reduces the frizz and leaves your hair smooth and silky. And because it is thin and lightweight, you can iron your hair comfortably and style it according to your preference. These titanium plates conduct high heat and resist corrosion. Hence, provides a long-lasting service for all your styling needs. As Babyliss is known for its incredible durability, it doesn’t chip or damage easily. While the others have a huge range of heat options, this hair straightener has 50 heat options that you can adjust according to your hair type! It is effortless to use, slim, lightweight, and durable. Apart from its maximum comfort, you can also take it with you when you travel! 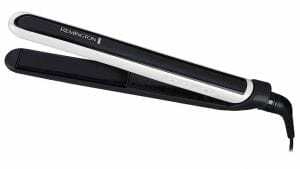 Down to our second list is another amazing flat iron from Remington. It’s among the best-selling Remington hair straighteners that you can find on the market today! One of its highlights is the anti-static technology that delivers 50% static and fewer flyaways so you can achieve that smooth and straight hair that you can flaunt all day! It is designed with heat options that can go up to 410F. It heats up quickly, and in just 30 seconds, you can have it all prepped for all the styling you want for your hair. With the combination technology of titanium and ceramic, the heat distributes evenly, provides fast heat transfer, and keeps the hair smooth and shiny. You can adjust the temperature with the heat settings that’s fitting for your hair type. With the modern LCD screen, you can view the settings and customize it anytime you want. It’s durable, easy to use, and reliable! Still can’t find the ultimate solution for hair straightening and styling? Perhaps you need to head out to the store and find this top hair iron on our list! 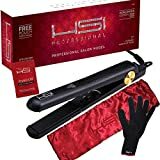 This HSI professional glider is designed with ceramic tourmaline technology that highlights its ability to straighten all types of hair – from the frizziest to the coarsest hair! And even you have delicate or fine hair, you can rely on it with the best styling results. You can use it to curl, straighten, or flip your hair with dramatic waves. The high-quality ceramic plates feature 8 Heat Balance microsensors that stabilize the temperature to provide the ideal heat according to your hair type. It is infused with ceramic and tourmaline crystal ion plates that make the hair much shinier, smoother, and silkier. So whether you straighten, curl, or flip your hair in any style you want, you can achieve a great-looking hair all day. It has heat settings that can go up to 450F and is adjustable according to your hair type and length. Hair is a woman’s crowning glory. If you want to flaunt your smooth, shiny, and straight hair, you can style it with the right hair straightener. No one ever wishes for a bad hair day! That’s why you need to equip yourself with the best hair straightener and pump up your hair with the style and texture you want. To help you find the ultimate solution for your hair straightening and styling needs, you need to consider the material, the technology used, the heat control, the hair type it is compatible with, the size, and the safety features. Our list uncovers all these important details, and we hope you find the one that’ll suit your needs!